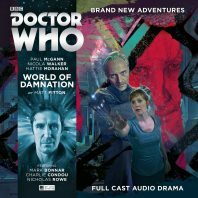 The Doctor and Liv have finally tracked down the missing Helen Sinclair in Matt Fitton’s ‘World of Damnation,’ arriving on the maximum-security planetoid of Rykerzon where only the most dangerous criminals in the star system are confined. The Governor here plans to reform his inmates using the culinary delights of the notorious Kandyman, but he soon finds that the mysterious figures known as the Eleven and Helen are particularly troublesome and that he is not quite as in control of events as he has been led to believe. With so much time having passed since the release of Doom Coalition 4 and within the personal timelines of the Eleven and Helen, the progression of the relationship between these two could have been re-established in nearly any fashion, but having Helen act in a surrogate supportive and almost maternal role as she tries to repress the Eleven’s worst personalities and traits and to maintain stability and a seeming happiness is an incredibly interesting development that can only hint at just what they must have survived and endured together for so long. A prison filled with hardened criminals is hardly the ideal environment for reform, but Mark Bonnar and Hattie Morahan are unbelievably nuanced and emotional in these crucial moments to set the scene for anything but the expected after an opening monologue that mysteriously sees the Eleven ask himself what would happens as the Time Lord mind reaches capacity since nobody like him has ever survived past the eighth incarnation as the voices become too much to handle. At the same time, although the Kandyman was a unique one-off villain from ‘The Happiness Patrol’ who never exactly screamed for a repeat appearance, his apparent reform to a model citizen within the prison as he helps the Governor experiment with food-based means of achieving peace and tranquility within those same hostile confines creates a suitably engaging backdrop laced with both familiarity and novelty, and Nicholas Rowe’s subtle tones and his character’s blunt aside that he understands where his best interests reside makes it clear that he has not changed quite so much as he would like some to believe. Unsurprisingly, the Eleven and the Kandyman form an alliance of sorts to furtively help bring about a change to their mutual situation, but it’s still wholly surprising even after the Eleven states that Helen represents the best of him as he tries to understand how she can look beyond his past misdeeds that he would halt the Governor’s orders to have her terminated for possibly still holding onto the Sonomancer’s powers after her destructive appearance so long ago. The Eleven is never one to be taken at face value, but this turn of events hints at perhaps a deeper sentiment than he would care to admit to himself even if his own self-preservation and advancement remain paramount. The Doctor is somewhat more sidelined than usual here to allow the setting and the two eerily effective villains to adequately breathe as he is subjected to an extensive empathy test and ends up challenging the very constraints of the operating system, but Liv Chenka shines as she gets to put her med tech skills to good use after coming upon the intriguing prisoner duo of Ruzalla and the aptly-named Crabhead who have just survived an ordeal with Kandyman’s pet spider the Doctor later recognises and knows must be somehow intrinsically tied to the psychic effects so prominent around them. ‘World of Damnation’ is very clearly the first of a two-part adventure and so doesn’t present any payoff just yet beyond a wonderful fleeting reunion between the Doctor and the Kandyman once the Doctor is rescued from a very peculiar web, but it spends just the right amount of time with each of its returning and brand new characters to fully develop their personalities even as true motivations remain closely guarded secrets. With the Doctor ominously warning Liv that Helen may not be the same person they knew after the story spends so much time setting up the dramatic relationships between the Eleven with both the Kandyman and more surprisingly Helen herself, the scene is set for an emotional and danger-filled finale to Ravenous 1 that has just delivered its first vital instalment.